Each capsule contains 250 mg Quercetin (a bioflavanoid found in many foods and plants) and 125 mg. Bromelain (an enzyme found in pineapple) containing 1,500 GDU per gram.! Quercetin modifies the body's response to antigen substances, inhibits formation of free radicals and supports circulatory health my promoting integrity of tissues in small blood vessels. 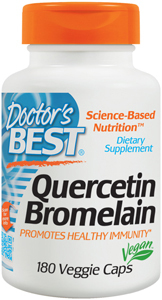 Bromelain supports tissue health as an anti-inflammatory agent and may enhance Quercetin absorption. This supplement is also beneficial for food allergies taken 30 to 60 minutes before mealtime. One clinical trial conducted in 2005 at the University of Utah with 41 pre-hypertensive or stage 1 hypertensive subjects suggest that quercetin supplementation may help control high blood pressure. Quercetin and other flavonoids help block the receptor for angiotensin II, the hormone that triggers the constriction of arteries. Pre-hypertension was defined as having a blood pressure of 120–139/80–89, while those with 140–159/90–99 were categorized with stage 1 hypertension (as per clinically accepted guidelines at the time). Potential study candidates were carefully screened for chronic disease or other possible interfering factors (i.e., blood pressure medication or other supplementation), and only non-smokers who were not pregnant or nursing were allowed to complete the study. Participants were randomly divided into two groups, and for four weeks, took 365 mg of quercetin twice a day (based on in vivo animal studies) or a placebo. Results demonstrated that quercetin supplements reduced both systolic and diastolic pressures by five to seven points for those suffering from hypertension, regardless of age, gender, or weight, with no changes in those with borderline normal blood pressures. Given the statistical data, these reductions are considered significant and are associated with decreased risks of mortality from stroke and heart disease. My recommendations for HBP include Magnesium, Coleous forskolhi, CoQ10, Nattomax, and Quercetin, (365 mg twice a day). Allergy, Hayfever and Cold symptom relief as a natural anti-histamine. Quercetin can fight the negative effects of stress as it suppresses the enzyme necessary for cortisol release.